TULSA — One cat owner might be wondering where their furry friend wandered off to. 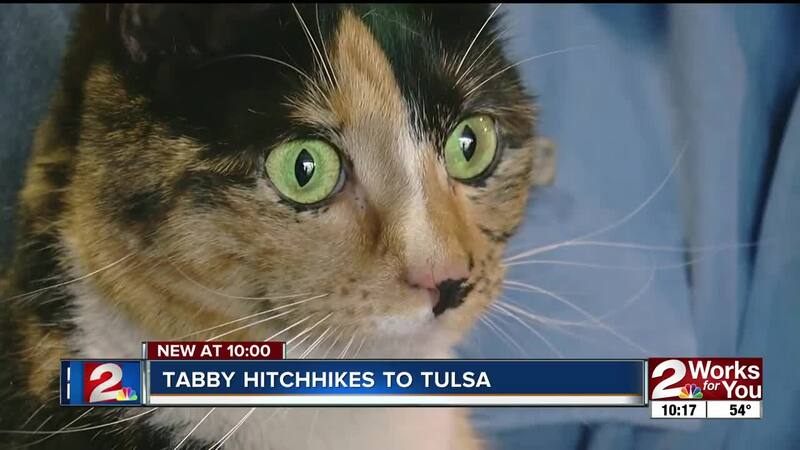 That's because a green-eyed feline hitched a ride in a car headed from Mustang to Tulsa. Firefighters at Ladder 23 was called when some strange sounds started coming from the car when it stopped in Tulsa. "The people driving heard the cat meowing along the way and thought it was coming from the kid's video game," firefighter Aubrey Emerson said. "And sure enough, they got there, looked inside the engine compartment and there she was." The tabby managed to make the hundred-mile ride hanging just inches from the road. She is now safe and sound but has no ID.